It has been a difficult week or two for so many whose eyes rest upon these words. Our Barony is affected by difficult situations both from afar and near within the SCA. We are feeling the pain of loss, of division, even of disillusionment. So many of us feel lost… our hearts and our spirits ache with it. My dear friends and chosen family, remember who we are…. We are the newcomer with eyes bright and interested at their first tourney, or choosing the language and script for our first scroll. We are brothers- and sisters- in arms, fighting side by side in joy and companionship. We are the camp that comes together to find shovels and ropes, drenched by a downpour, so that our neighbors’ Pennsic homes are saved. We are the group that makes hot soup and tea for those bedraggled camp saviors. We are the family that comes together to support a virtual stranger with food and hugs and tears in the time of the greatest grief. We are the grizzled old-timer, telling stories around the fire, and lending wise words to open minds. We are the gentle striving toward the Peerage, taking an inner journey to mold their spirit in courtesy and compassion. We are the smiling, laughing dancers and singers, with music filling our hearts. We are the Royal that spends countless at home hours facilitating appreciation and looking for ways to enhance Their peoples’ delight. We are the artisan that falls into the rabbit hole of researching their passion, a journey of all shapes and times. We are the circle of friends by the fire, in homes, in meeting halls, planning shenanigans and fun of all kinds. We are the bards, the scribes, the fighters, the parents, the children, the craftspersons and artisans, the martial specialists, the officers, the teachers, the students, the family and friends that love and respect each other. We are a community. We are the SCA. We are AEthelmearc. We are the Debatable Lands. Remember who we are. Hold out your hands in friendship to those you don’t know, and those you do. In reason and compassion, respect and forgiveness, joy and passion… remember who we are. Support each other, nurture each other, enjoy each other. The next Business Meeting for the Barony-Marche of the Debatable Lands will be on Wednesday, 7 February 2018 from 8:00 p.m. until 10:00 p.m. at Allegheny Unitarian Universalist Church (416 W North Ave, Pittsburgh, PA 15212 – map). The Officers of the Debatable Lands are elected by the membership and is made up of members of the populace, just like you. The Officers are responsible for ensuring that the policies of the Kingdom and Barony are followed and are accountable to the populace of the Debatable Lands. The Business meeting is open to everyone in the Barony and attendance by the populace is encouraged. Have a thought you’d like to share with the Officers? Email seneschal@debatablelands.org. Here beings the court report of Brandubh and Hilderun, Baron and Baroness of the Debatable Lands, at BMDL Twelfthnight, January 13, AS 52. Their Excellencies bid everybody welcome to another Twelfthnight, and appreciated the populace’s attendance for the unusual afternoon court. The Royal Livery Company was invited to come before Their Excellencies to be recognized for their skills and achievements in “Death From Above!” at War Practice and Pennsic. For this the Company was awarded an Iron Comet. Scroll by Lady Alysoun of the Debatable Lands, with words by His Excellency Brandubh. Their Excellencies called forth Master Emrys Eustace called Broom and praised his organizational service to the Baronial encampment at Pennsic, and awarded him a Gold Comet. Scroll illumination by Lady Rivka bat Daniyel, calligraphy by Lady Ceindrech verch Elidir. Their Excellencies called Traygor Greypanther to approach them, but he was not in attendance. Their Excellencies then called Jasmine of Clan Tarn to approach them, and presented her with a Gold Comet for her service as new youth marshal and her efforts to the youth fighting community. Scroll by Nicola Beese. Their Excellencies called Raven Whitehart before them to thank her for her service to the BMDL by teaching classes, creating beautiful scrolls, and general helpfulness. They awarded her a Comettus Amicus in recognition, and made her a friend of the Barony. Scroll by Mistress Antoinette de la Croix. Maighster Uilliam mac an t’Saoir was instructed to approach Their Excellencies, who recalled his feats of prowess on the fields of battle, both as army commander and in the single lysts. He was thusly awarded an Iron Comet, with scroll by Lady Ceindrech verch Elidir. Their Excellencies invited Sumayya al Ghaziyah to approach them, and recounted all that she has done for the Barony: Chronicler, A&S coordinator for the St. Crispins A&S competition, coordinator for kingdom largess, and leatherworker’s guild mistress. For all this, she was awarded a Gold Comet. Scroll forthcoming by Lady Rivka bat Daniyel. Sile inghean Chein was next called before Their Excellencies, and they proclaimed how impressed they were to see her have tried nearly all martial forms in the Barony, including heavy weapons, combat archery, equestrian, traditional archery, and thrown weapons. They presented her with an Iron Comet for such deeds. Scroll wording and illumination by Master Alaric MacConnal, calligraphy by THL Rachel Daliceaux. Their Excellencies then desired to see Gesa von Wellenstein before them. They pointed out the previous equestrian activities in the BMDL- none. For starting the equestrian activities in our Barony she was awarded a Gold Comet. Scroll illuminated by Meesteres Odriana vander Brugghe and calligraphy by Maighster Kieran MacRae. His Excellency proclaimed that his cup was empty, and called THL Madoc Arundel to be brought from the bar downstairs to address this issue. Rachel Daliceaux was then called before Their Excellencies, much to her confusion, and proclaimed the challenges of planning to recognize their Baronial Signet when she was still in the room for court prep! But for Rachel’s beautiful voice and scribal skills, she was awarded a Silver Comet. Scroll words and illumination by Master Alaric MacConnal, calligraphy by Lady Ceindrich verch Elidir. Once Madoc Arundel surfaced to the gathered populace, Their Excellencies called him forward, not just to fill their glasses, but to praise him for his dedication in bringing such fine ales and spirits (and means of serving them!) year after year to the Barony’s Twelfthnight celebration, and awarded him a Comettus Amicus, making him a friend of the Barony for such deeds. Scroll illuminated by Meesteres Odriana vander Brugghe, calligraphy by Maighster Kieran MacRae. Their Excellencies called all scribes and wordsmiths who contributed to the scrolls that went out this day to attend them, that they may receive tokens of appreciation. Just before the Court of Their Excellencies was to be suspended, members of I Genesii approached and went on about some kind of ‘magic trick’, about some kind of ‘disappearing’, which sounded most suspicious. A sheet was raised in front of Their Excellencies, incantations were uttered, and somehow Their Excellencies Uilliam and Constance were sitting on the thrones, replacing Brandubh and Hilderun!! Apparently this was not according to plans, and the sheet was once again raised, more babbling happened, and when the sheet lowered, there were… was I hallucinating? ?… Lord Robert MacEwan of Thornhill and Lady Alethea Cowle? ?… In the seats of Their Excellencies?… as Lord and Lady of Misrule?!? Feeling faint, I quickly suspended this Court of Their Excellencies before I lost control of any more of my senses. In the evening Their Majesties Gareth and Juliana gave leave to re-open the Court of Their Excellencies. Their Excellencies called forth current Bardic Champion, THL Silence de Cherbourg, regarding the afternoon’s Baronial Bardic Competition. Silence called forth the two finalists, THL Pavel Dudoladov and Mistress Arianna of Wynthrope, and announced Arianna the winner and new Bardic champion, with Pavel to serve as second at the next Seven Pearls event. Award scroll began by an unknown scribe, illumination finished by Mistress Arianna, and calligraphy by THL Rachel Daliceaux. Their Excellencies then called forth their current A&S Champion, Lady Bugga Bilibit, to report on the day’s Baronial A&S competition. The entries were wondrous all around this year, and the two finalists called forward were Mistress Fredeburg von Katzenellenbogen and THL Lucetta di Cosima, and announced Fredeberg the winner, and Lucetta to serve as second at the next Seven Pearls event. Scroll by Lady Alysoun of the Debatable Lands. Report submitted by Kieran MacRae, Comet Pursuivant. Tavern in the Park — Merchant Alert! If you are interested in selling SCA-related wares at the Tavern in the Park (North Park, Feb 10, daytime), please email me at emily4knee (at) gmail (dot) com. I am organizing the merchant room for the day! I am excited to announce that Gesa has the dates for equestrian practices finalized! The practices will Start on Friday April 6,2018 and end on November 23,2018. There will be mounted games practice every Friday. Then on the 2nd Wednesday of every month we will be practicing riding before the prince which is Medieval dressage. The cook for Tavern in the Park, Lady Kattera Doplerin has published the menu, and it sounds amazing. If you have any dietary concerns or needs, please contact Lady Kattera at legbascrossroad(at)gmail(dot)com. Fight practice will be held at the Chinese Church from 2 PM til 6 PM on January 28. Hope to see many of you there this week. My term as Seneschal will be coming to an end in February, and I will be seeking a second term, however, I am calling for letters. Send your letter to the Baronage and to me – baron(at)debatablelands.org, baroness(at)debatablelands.org, and seneschal(at)debatablelands.org. The deadline for letters is Thursday, 1 February 2018 to allow sufficient time for your letter to be reviewed by the Officers’ prior to the February Business Meeting on 7 February 2018. No letters will be accepted after that date. As always, if you have any ideas about how to improve anything in the Barony or have concerns, I am available via email (seneschal@debatablelands.org), in person at events and meetings, or using our new Baronial Suggestion Box. Right now I have a commitment for the same truck and trailer combo we had last year, so we’re going to go with that as our float. I still have those custom made banners, the ballista and that awesome throne. The staging area will be on Liberty Ave, South Side. The exact spot will be sent to me once the Parade Committee has placed all of the entries. I think we were at the corner of 31st street last year. The truck team has to arrive at 8:30am. Marchers at 9. The parade starts at 10, but that is the front of the parade, we’ll be waiting a bit, so don’t worry about being a tad late. There is room for riding on the trailer and the truck is a crew cab. We’d like to save these spots for people with mobility issues, but there should be enough room to swap out for a quick rest. 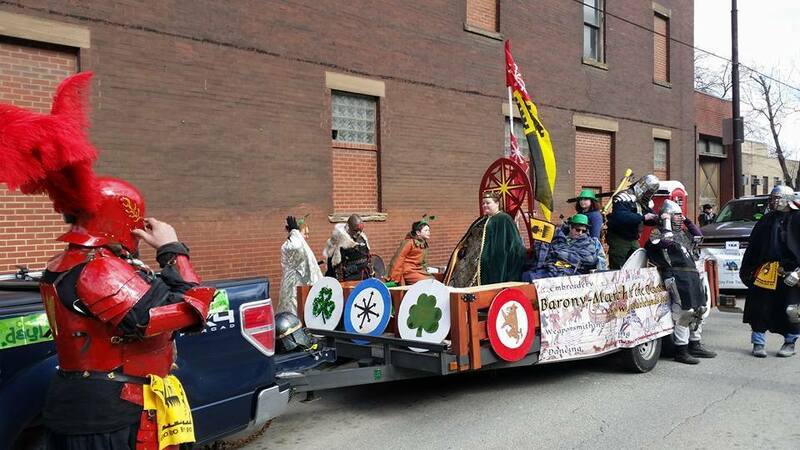 It may be the St Paddy’s, but no drinking before or during the parade. No throwing things into the crowd. You can hand out beads or candy or BMDL business cards or pamphlets. 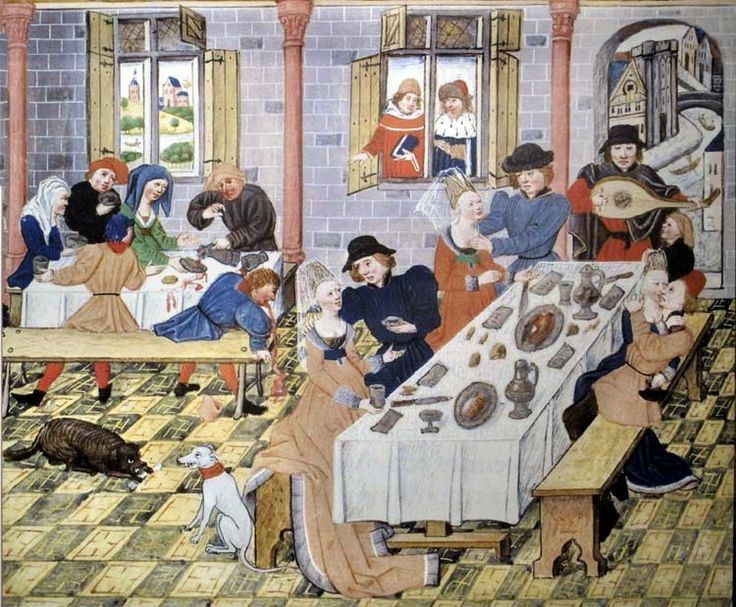 There is a facebook event and it is also on the Baronial Calendar. The Seneschal’s Spotlight is a monthly feature that highlights an aspect of the Barony and/or its people. 10. Learn about the various Baronial Awards. 9. Subscribe to the Stórfréttir, our home for breaking news, updates, and articles. 8. Print out the required signs for Troll. 7. Read the Baronial Policies. 6. Find the email address for the A&S Minister to volunteer to teach a class at A&S Night. 5. Look at the BMDL Calendar to see when practices, events, and meetings are being held. 4. Write a recommendation letter to tell the Baron and Baroness about the cool stuff you see in the Barony. 3. Visit the Newcomer’s Portal – It’s a wonderful resource, even if you’ve been around a while. 2. Contact Mistress Arianna and either share your contact information or update your contact information for the Dark Pages. 1. Send your thoughts on how to improve the Barony through the Baronial Suggestion Box. If you have something that you’d like to share or someone that you would like to contact, you’ll find that information on the Website. As with any resource, its value lays in how easily you can find information, so if there is something that you would like to share on the website, see more of on the website, or don’t know where to find something on the website please contact Kameshima Zentarō Umakai at webminister(at)debatablelands(dot)org. 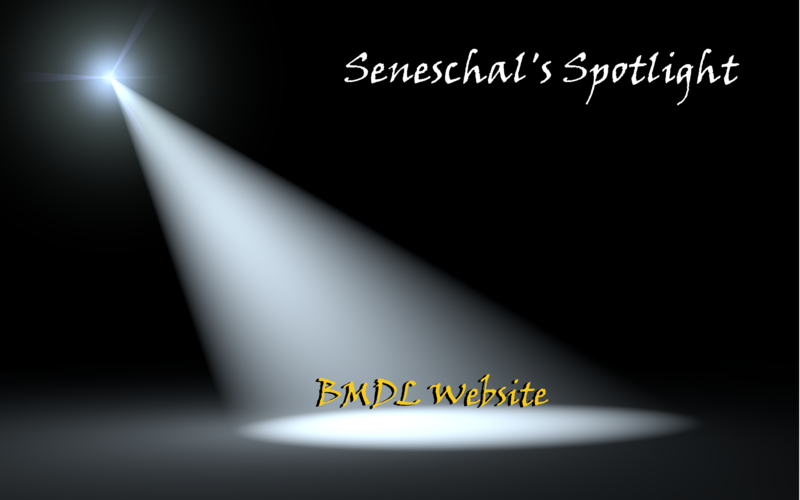 Also, if you would like to see a Seneschal’s Spotlight cast in a specific direction, please let me know. My contact information is seneschal(at)debatablelands(dot)org.